List them in that order, and make sure there are no blank spaces at the end of each line. 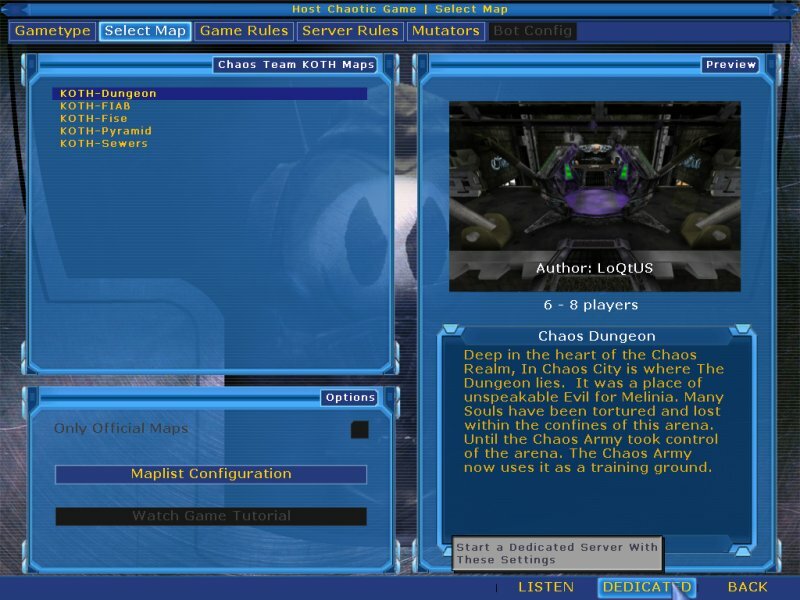 To start a server running ChaosUT2, simply select ‘Host Game’ from the main Chaos menu. Don’t forget that clicking on the ‘Settings’ tab first will allow you to configure various default Chaos settings. Some Chaos game types will have their own options under this Server Rules section. For example, it is here where you can adjust the ‘Warmup’ time for Chaos CTF. 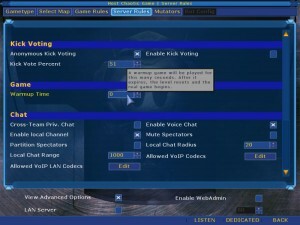 Just as in normal UT2004, you then simply select a ‘Listen’ or ‘Dedicated’ server to launch the game. The ChaosUt2 settings are also available to server admins thru the standard UT2004 Remote Web Admin interface. In order to set the various ChaosUT2 settings through the Remote Web Admin, you must first add the Chaos mutator to your games – even the Chaos game types. 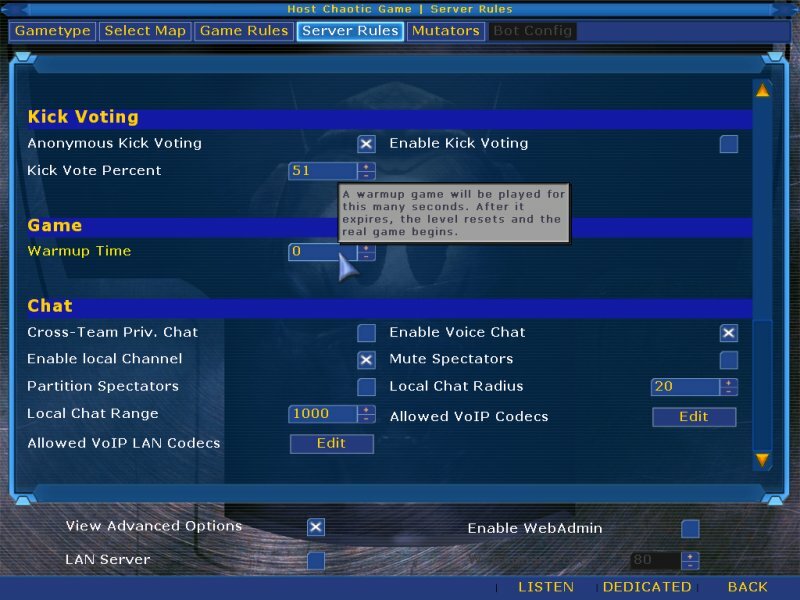 Some Chaos game types offer melee-only versions (DM, TDM, KOTH, Team KOTH). It is possible to set up your server with a ‘normal’ and a melee-only version of the same game type. To do so, use the Voting GameConfig screen to create two versions of that game type, and then simply put bMeleeGame=True under the Options for one of them, and put bMeleeGame=False for the other one. Be sure to give them obvious Names that tell them apart (ie: Chaos DM, Chaos MeleeDM), this way the players can vote on which they want to play.